Kilian Jornet is a renowned adventurer. He was selected as a National Geographic Adventurer of The Year twice, and has won The Hardrock 100 in 2014, 2015 and 2017. In addition to ultra running and mountaineering, Jornet is a professional Sky Runner. On his ‘Summits of my Life’ website, Kilian Jornet’s goal of setting speed records is detailed. There has been controversy surrounding Jornet’s Summits of My Life project related to his attempts at Mt Everest. This controversy is not new. Questions regarding Jornet’s May 2017 ascents were first publicly questioned as early as December 2017 when Dan Howitt released his investigation regarding Jornet’s claims. Athletics Illustrated interviewed Howitt in March of this year. Jornet claims to have completed a double summit of Everest. On May 22nd 2017, Jornet claims to have summited Everest in a time of 26 hours. This has been reported as a new “Fastest Known Time” (FKT). Jornet claims to have summitted without the use of supplemental oxygen or fixed ropes. 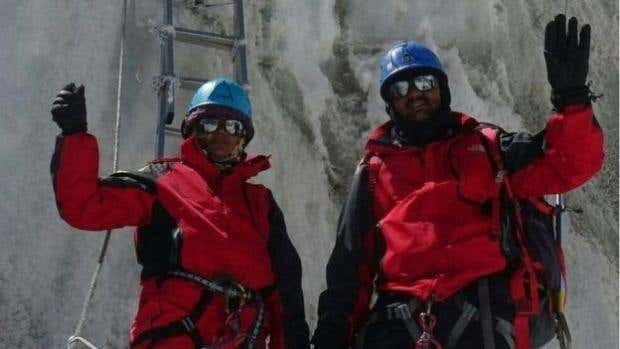 Furthermore, Jornet claims to have completed a 2nd ascent of Everest from Advanced Base Camp on May 27th 2017 with a total ascent time of 17 hours. In a new 56 page report, independent investigator Andy Tavin, provides very detailed and convincing evidence regarding the 4 key claims Jornet makes regarding his Everest ascents. Tavin was given access to Jornet’s original GoPro footage and GPS data. His findings center on the data he is able to extract from this evidence. I will briefly summarize Tavin’s findings. I encourage everyone to read the full report. The information below is largely pulled from Tavin’s report. reading of just over 8500m, and he did not call anyone via his satellite-smartphone from the summit, nor near the summit. Additionally, it was noted in Howitt’s and Tavin’s reports that while Jornet provides ascent times down to the minute for his other ascents, only approximate times are provided for his Everest ascents. After learning of Howitt’s report after it was posted on letsrun.com, Tavin reached out to Jornet’s represntatives after they had failed to provide promised evidence of Kilian’s ascents. While there was an issue with some of Kilian’s data, Tavin was able to confirm using Kilian’s GoPro GPS data that Kilian did successfully ascend Everest on May 22nd 2017. Jornet publicly claims a 26 hour ascent time for his first ascent, This is the claimed ascent time that is repeated in the documentary of his ascents ‘Path To Everest’. Tavin concluded that the actual ascent time was approximately 26:31:06. Jornet has later claimed the 26:31:00 time in response to the Howitt investigation, although the 26 hour time is still quoted in media sources and in the documentary. For Jornet’s claimed 2nd ascent, Tavin was unable to confirm that Jornet successfully reached the summit. He did conclude that if Jornet did summit that it took him significantly longer than claimed. Photos taken that originally were claimed to be at the summit were proven to be taken at a location below the summit. Jornet made contradictory statements regarding the lack of photos at the summit. According to the report, he claimed initially to have spent 10 minutes at the summit. But he stated that due to high winds he immediately descended, and that he did not have time to take photos from the summit showing his watch. The report details that the lack of uphill GPS data. GoPro timestamps show that if Jornet did reach the summit on his 2nd attempt the time of the summit would have been anywhere between 2h to 2 hr 28 minutes longer than he claimed in public and to the Himilayan Database. From, Himalayandatabase.com – The Himalayan Database is a compilation of records for all expeditions that have climbed in the Nepalese Himalaya. The database is based on the expedition archives of Elizabeth Hawley, a longtime journalist based in Kathmandu, and it is supplemented by information gathered from books, alpine journals and correspondence with Himalayan climbers. Tavin’s report was reviewed and his work “received no major objections from The Himilayan Database reviewers”. Jornet is fully sponsored, and as mentioned above, a documentary, Path To Everest was released detailing Jornet’s journey. Again, I recommend reading through the entire report. This isn’t the only time someone’s Everest claim was challenged. In 2016 an Indian Couple photoshopped themselves at The Summit of Everest, resulting in a 10 year ban. They were also fired from their jobs as Police Constables. In the 2012 Speedgoat 50k, Jornet was found to have repeatedly cut switchbacks. It is standard in Europe and to allow this. Cutting switchbacks is not allowed in nearly all US Ultras and was not allowed at The Speedgoat 50k. He was stripped of the course record and the associated prize money. He was given a time penalty, and the official course record went to the 2nd place finisher along with the prize money for breaking the record. Jornet did not fight the ruling. Jornet was allowed to keep the 1st place finish. Next articleWhy Was The Homeless Bandit Singled Out? Mmmm, I am sorry but this time I am not buying it. Let’s start from the end of your article. Speedgoat. While it is true that cutting switchbacks is not allowed in nearly all US Ultras, it’s not true that it wasn’t allowed in Speedgoat 2012. The switchback rule wasn’t mentioned at all and was added as a consequence of the controversy. We are not talking about a person that needs to cheat here. Killian has been winning any race he took partfor the last decate now, the guy is an unbeatable beast. As for the summit, this is the third time somebody tries to prove he hasn’t summitted. And, from what I read, in this article, it doesn’t even prove anything . He simply questions the times of his acends right? I mean … we are talking about a person that summited, without oxigen or ropes twice in 5 days. His times are (apparently) not accurate so we’ll put him on the front page of marathon investigation like a chep cheat that has cut a Marathon? In the rules, it stated to follow all course markings. I personally saw Kilian cut a switchback directly in front of me about mile 10. Rickey Gates, who was in 2nd at the time, saw it too, said WTF? I said keep running, we’ll figure that out later. Upon mile 22, Kilian was warned from a Salomon teammate NOT to cut switchbacks. He cut switchbacks heading down the Little Cloud bowl area in plain view. He was warned, he was penalized. That info from the RD, me. He is still the most badass mountain runner on earth! And I felt really bad for having to DQ him, but he took it in stride like a pro and was a first class person at the awards. Just thought I’d clarify your mis-informed comment. Thanks Karl! Your statement on this matter is, of course, authoritative. I’ve agreed with much of your work, as runners cheating is a stain on the sport. But this article is a blemish on your investigations. 1.Howitt’s report was retracted by Howitt himself. 2. The Speedgoat “controversy” was resolved at the end of the race. PS: cutting switchbacks –which Killian never denied– is accepted in many European Races. 3. Are you trying to draw a parallel between people who published a photoshopped photo of themselves and Killian? That’s just cheap, and ironically, while it does not raise questions about Killian’s motivations and honesty, it does raise questions about your techniques and motivation. I felt the report was very well done and impartial. And, if you take note it actually somewhat vindicates Jornet in regards to the first ascent, in which prior reports questioned. Where there is real question was with the 2nd ascent. There is still much question about whether he actually ascended. No proogf has been provided indicating definitively that he did–so that is unresolved. There were some pretty clear attempts to deceive–reporting the photo as being at the summit when it was not–and replacing audio from the video. All excellent points, and very close to my reaction after reading. I was not drawing a parallel. Just showing that here has been cheating a Everest and that there are consequences. Read Karl’s comment regarding Speedgoat. Jillian was told that cutting switchbacks was against the rules and continued. He was witnessed cutting the switchbacks. He had no choice but to admit it. This in no way affects any of my other investigations. I was reporting on someone else’s investigation. One which Infeel was very thorough and impartial. one day you have to die so tell true History your world .Nobody say why you do not climb ? I agree with the above poster. You have cheapened your brand and sullied own credibility with this garbage. The Faking Everest and Speedgoat 50k Controversy blurbs at the end are right out of the Fox “News” or Infowars playbook. This whole thing makes you look desperate for clicks. Infowars? Really? Posting about the previous controversy without adding in any opinion or commentary was entirely appropriate. The example of the couple cheating at Everest was included to show that there have been instances of fake ascents. Nothing posted was sensationalized, or embellished, or made up as you seem to suggest. I simply posted the facts, without commentary. Somewhat amusing to see people’s concern that Derek is covering items outside marathons. A world-renowned climber boasts of climbing Everest back to back in WR time with no supporting evidence of a 2nd summit, no video, no photography, and lots of inconsistencies? I’m interested. Simply don’t understand any criticism of pointing this out. The climber may be a very, good guy. He’s obviously talented. All the more reason to make sure the people we look up to aren’t cutting corners or inflating actual achievements. I’m a little disappointed that “marathon” investigation is reporting on mountain climbing. Not what I’d expect. Let’s keep the focus of your work on where the readers expect it; on running and athletics. What’s next? Car racing cheats? First, I didn’t perform this investigation. I am reporting on someone else’s investigation. Second, Jornet is a well known ultra runner–so I felt it’s relevant. Third, This started as a personal blog..focusing on marathon cheats. I have long ago expanded the scope to report on triathlons, ultras, transcons, etc. These stories are not in place of the marathon/Boston cheats, but in addition to that. If my sole focus were just marathons and cheating for Boston, there’d be far fewer articles. I find it easier to believe that you are using the notoriety of Kilian’s name to increase your site hits and donations than I do to believe that Kilian would lie about this. Frederick Cook claimed to have achieved the first summit of Denali (also known as Mt. McKinley) in September 1906. His photograph which he claimed to be of the summit was found to have been taken of a tiny peak 19 miles away. Cesare Maestri claimed to have climbed Cerro Torre in 1959. Maestri and Toni Egger were last seen below the Col of Conquest. Six days later Maestri was found lying face down and almost buried in the snow. They returned to base camp, with Maestri claiming that he and Egger had reached the summit but Egger had been swept to his death by an avalanche as they were descending. A later expedition followed his route and found that bolts, pitons, fixed ropes and other equipment used by the 1959 expedition is plentiful up to that point, but absent thereafter. Tomo Cesen specialised in solo ascents in the Alps and the Himalayas. At the age of 26, he reported that he had climbed the three Great north faces of the Alps, becoming the first person to do so solo in winter. He has claimed a number of other notable mountaineering achievements, but some of his claimed ascents have often met with skepticism from others in the mountaineering community. The most controversial was his 1990 solo ascent of Lhotse, the 4th highest mountain in the world. Oh Eun-sun in April 2010 claimed to be the first woman to have climbed all 14 8000 meter summits so beating Edurne Pasaban who achieved the feat in May the same year. However, Oh’s 2009 summit of Kangchenjunga has been questioned, throwing her accomplishment into doubt. Her summit photo is very fuzzy and shows her standing on a rock. But other expeditions that climbed the mountain that year show the summit snow covered. Also, two of the three sherpas that accompanied her said she did not reach the summit. he also used a steroid dexamethasone for one of his 3 failed Everest summit attempts as reported by outside.magazine. It is apparent that fans of Jornet are defending him here. Think with logic not your heart. BTW Howitt has not rescinded his claims against Jornet, quite the opposite. He has submitted a new version of facts, edited and more concise and has dug his heals in deeper.